In general, yeasts used in brewing are very clean and easily counted using Cellometer image cytometer bright field capability. In addition, in order to measure the viability of the yeast sample, propidium iodide (PI) or oxonol are fluorescent viability dyes that can stain dead cells. Therefore, the total cell count is measured in bright field images and dead cell count is measured in the fluorescent images. 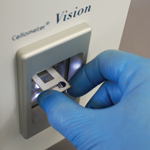 Automatically measure yeast cell size and concentration using Cellometer image cytometer. Serial two-fold dilutions of rehydrated yeast were counted on the Cellometer Auto X4 (10x) to determine the linear range for reliable yeast concentration measurements. The range of concentration that can be measured on the instrument is dependent on the size of the cell being counted (i.e. the range decreases as cell size increases). The Muntons strain is approximately 4.5 µm in diameter when rehydrated, and was selected for this experiment due to its intermediate size when compared to other yeast strains such as those used for lager beer or wine production. The upper limit for accurate yeast counting, as determined by examining counted images, represented a four-fold dilution of the original concentrated yeast suspension (Dilution 2) at 6.6 x 107 cells/mL. Serial dilutions of this sample were counted until the lower limit was reached (Dilution 6) at a concentration of 4.17 x 106cells/mL. Linear range of accurate yeast concentration measurements and corresponding CV values. Munton’s yeasts were allowed to rehydrate for 30 min, and then stained 1-to-1 with propidium iodide (using FOM VB-595-502 or VB-660-503). 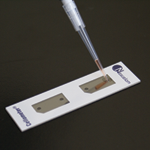 The yeasts were immediately analyzed using Cellometer to measure the viability, concentration, and cell size. The bright field images were counted to measure total cell count, while the fluorescent images were counted to measure dead cell count. Munton’s yeasts were allowed to rehydrate for 30 min, and then stained 1-to-1 with oxonol (using FOM VB-535-402). 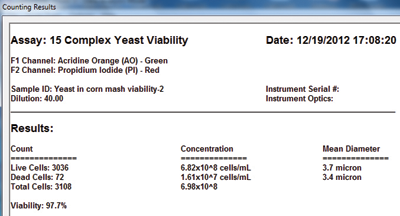 The yeasts were analyzed after 5 min incubation, using Cellometer to measure the viability, concentration, and cell size. The bright field images were counted to measure total cell count, while the fluorescent images were counted to measure dead cell count.